Almost 12 years ago, my family started farming in Chile. Our time there has been full of ups and downs. We’ve survived one of the largest earthquakes in recorded history, as well as a devastating forest fire that burned through all our olives and vines last year (I wrote about it here). But we’ve also experienced the joy of drinking wine and eating olive oil made by our own hands. We’ve lived the dream of harvesting almonds straight from the tree (the tastiest evening snack imaginable!). Plums, pears, peaches, black beans, tomatoes, squash — there’s an abundance we are grateful for and savour. At first, I found farming dull, old-fashioned and backwards. I was interested in science, technology, culture and cities — the way forward, the future. Farming seemed to be about sitting on tractors and keeping animals in dark, smelly barns. But over the years, I’ve realised that farming is a key part of the future and it’s incredibly innovative. Farms are our way of making food, fuel and fibre: they’re at the heart of our existence. Farmer John Cherry, a conventional farmer who has been innovating his farming methods for the last 8 years. 1. Soil Health: We are in the middle of an agricultural revolution, where soil is king. Much agricultural land has just 60 harvests left before nothing can be grown there, according to latest forecasts. Faced with rising costs and declining yields, farmers across the spectrum are focusing on improving soil health. Knowing that the important thing about soil is not just its chemical components, but also its structure and the critters that live in it, has changed everything. 2. Diversity: At the heart of Charles Darwin’s theory of evolution is the idea that diversity is key to resilience. A farming future that will last the next 50 years — never mind the next 100 — must be rooted in diversity. Mass monocultures are the opposite of this. 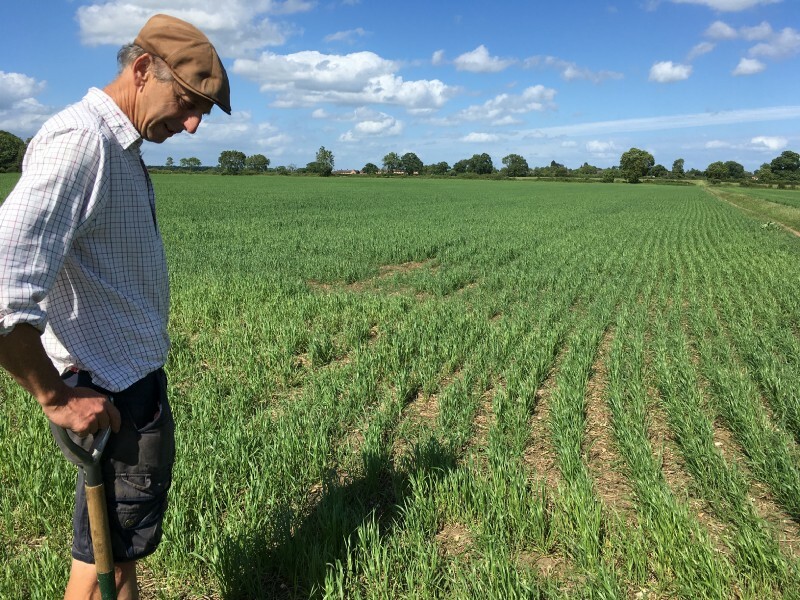 Diversity comes in many forms: agroforestry; companion cropping; cover crops; multi-layered animal rotations; wheat populations; growing heritage seeds; and seed saving, to name a few. If you haven’t heard of any of those, look them up — they are all very exciting! 3. Inclusive & Female Leadership: Last month, I attended a conference celebrating female leadership in the farming world. It was so inspiring to hear from female farmers and food crafters from across the US. Making space for a more diverse mix of people as the leaders of our farming future is a big part of ecological farming. Diversity on the ground will be reflected in the diversity of people making choices and working together. 4. Ecological Farming: The binary times of organic vs conventional farming are slowly fading away. New Ecological farming methods — working with and listening to natural systems — are being adopted across the organic and conventional divide. One example is Conservation Agriculture — never ploughing the soils (no-till) and growing a diverse mix of crops — which has brought a new level of wildlife, health and financial return to many conventional farms. Mob grazing — regularly moving a herd of animals to graze on different parcels of land — is another ecological practice adopted by farmers across that old conventional-organic divide. The new more nuanced world of ‘good’ farming is not yet being reflected in public discourse. We will find force in uniting under the new banner of ecological farming — leaving behind discussions of elitism that have haunted the organic farming conversations for years. 5. Data and New-Fashioned Farming: New tools and technologies will enable more ecological farming methods. For example, the ease of adoption of mob grazing is thanks to polyethylene pipes and electric fencing, which allow the traditional, labour-intensive system of rotational grazing to be managed by one or two people over a large land area. New digital services such as Open Food Network, which provides a centralised platform for farmers to sell direct to customers, promote more efficient harvesting and help smaller operations thrive. Mobile phones also let farmers collect data and observations in the field, so they can start to draw out patterns of what works and doesn’t work on their farm. I call this Permaculture 2.0 and have developed an app to help fellow smaller-scale farms here. 6. Multi-layered businesses: Part of resilient farming is having multiple income streams. One option is an alternative business run on-farm — such as adding solar panels to one field, or having a wedding venue in a barn. Another is a multi-enterprise farm — for example, a dairy farm might have a cheesemaker, honey producer and market gardener working in harmony on one farm. Equally, a grain farmer might work with a roaming herdsman. Clever land-sharing agreements are also opening up new ways of sustainably supporting multiple incomes from the same plot of land. 7. Sharing and Stories: For ecological farming to become the dominant paradigm, everyone who is part of it will have to share their stories far and wide. We’ll need more peer-to-peer learning networks, and we’ll also need to share the realities of farming — including the raw details of the constraints we face — with political leaders, cultural organisations and the public. Not everyone will want to be involved in farming, but everyone needs to believe that it’s possible for smaller-scale farmers to feed the world. Once people believe, we will regain our food sovereignty (the right for people to demand their own food and agricultural systems) as we start demanding this approach from governments and retailers. 8. Waste and Cycles: It turns out waste is a very human concept. The reality is that everything is cyclical. By shifting to this perspective, we can make better use of what is produced on the farm and that of neighbouring farms. That means we can work together to create more localised ways of sharing resources — a win for all. This message has already hit the public psyche in recent years and could be a great success story to follow. Many supermarkets now sell ‘wonky veg’ and several enterprises that make use of ‘waste products’ have sprung up. 9. Bigger is Not Better: More farmers are recognising that the ultimate success story is when what you produce is profitable, good for the environment and good for people. We’ve heard stories of people halving their sheep herds, so they can graze them outside all the time, and increase their profits. A farm in Denmark is dividing its 1,000 acres into ten 100-acre farms, as this opens up more potential for the farms to thrive. We can strive for maximum abundance as the ultimate success, not just maximum profit. Sometimes economies of scale do not maximise abundance. Abundance is a wishy-washy term, but I hope we can use tools such as True Cost Accounting to better understand the actual cost of scaling up or down, in order to define value beyond pure financials. 10. Working beyond your borders: For all the amazing improvements you can make on an individual farm, some of the most exciting projects are happening at the scale of water catchment areas and community-wide. For example, collaborative groups are tackling flood prevention across the borders of many farms. Others are implementing wildlife migration routes that traverse many plots of land. All these projects require a concerted effort across communities (or ‘bio-regions’) to transform the system. Wanna find out more about these trends? Tune in to our monthly episode of Farmerama Radio to hear stories from farmers across the world, check out the apps I have helped create here and see a bit more about what we are doing on my family’s farm here. Thank you to Hayley Ard for editing this article and James and Fred for looking over it! And thank you to all the farmers, scientists, & people supporting the farming community who have shared their time, thoughts and insights to help me formulate these ten points. This article is a tribute and thank you to all the great work you are doing.